The year 2000, or Y2K as it was known then brought in a new millennium. 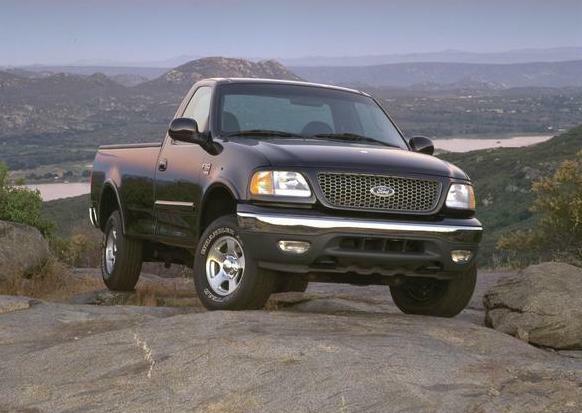 For 2000, the F-Series trucks were the best selling in the US for 22 years. In Canada, the F-150 was the best selling full-size pickup for the past 33 years. We have all the info you're looking for with regards to the F-150 for this year. Check out the video for sure, read the details on the new truck, and more. 2000 F-Series trucks were built at Ford assembly plants in Kansas City, Missouri, Norfolk, Virginia, Oakville, and Ontario; and for Super Duty only, Louisville, Kentucky. 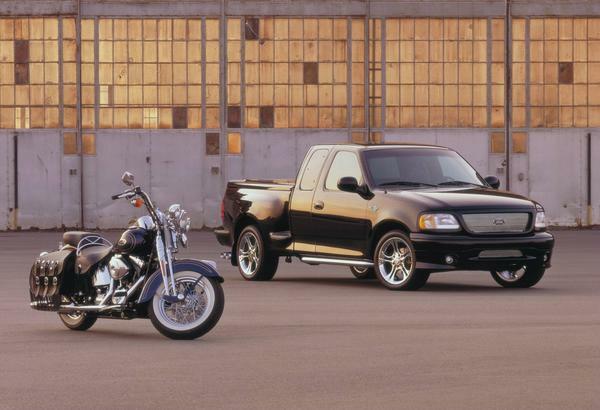 The biggest news for 2000 was the introduction of the first Harley F-150. More details on the smaller changes can be found after the next Harley section. Ford Motor Company and Harley-Davidson Motorcycles partnered to produce special trucks from 2000 through 2012. The five-year partnership was announced at the Sturgis motorcycle meet in South Dakota in 1999. The first of these partnership trucks was a SuperCab Flareside model could be had in any color you wanted, as long as it was black. The uniquely styled Harley-Davidson F-150 embodies many of the visual cues that have made the motorcycle famous. Its unique badging, dash ornament, accessory pouch with saddle-bag-like clasp on the centre console and unique "spun metal" instrument cluster melds the pickup's sleek toughness with the motorcycle's enduring muscularity and mystique. Other interior features include ebony black leather captain's chairs with Harley-Davidson logo on the seat backs, chrome steering column stalks and door release hardware and black leather trim and steering wheel. The truck was quite the hit, selling 8,197 trucks for this model year. It was built at the Ontario Truck Plant (OTP) in Canada. The wheels put on the Harley-Davidson edition F-150 were kind of a big deal to Ford. These unique wheels were the first 20" wheels put on a production Ford truck. Fun fact: The low-pressure cast aluminum, vented five spoke wheels measure 20" by 9", and were custom made for Ford by Superior Industries International Inc. of Van Nuys, California. The most noteworthy change is improved availability of the 5.4L Triton V8 engine throughout the lineup. P235 tires are now available for the 3.55 axle and a 3.31 rear axle replaces the 3.55 as standard on many models. This provides an alternative in powertrain while gaining better fuel economy. The Lariat focus is now on SuperCab and no longer available in Regular Cab. The F-250 (under 8500 lbs GVWR) badged vehicle is replaced by F-150 7700 Payload Group (627). Changes to the Series include: New overhead console with compass, outside temperature, and storage (standard for Lariat and XLT, optional in XL), LH and RH covered visor vanity mirrors (standard in Lariat and XLT), Standard driver's side keypad entry, chromed steel wheels and 17" OWL (outline white letter) tires on the Lariat, carpeted monogrammed floor mats standard for the XLT, standard cargo light for the XL and Work Series trucks. Optional content changes include pickup box security group dropped - with its contents now being included in the XL convenience group. The 3.73 rear axle in the Off-Road Group w/5.4L engine is now replaced by a 3.55 axle which maintains performance but increases fuel economy. In the 55R Off-Road Group, 17" cast aluminum wheels replace chromed steel wheels and a "4x4 Off-Road" decal is added to the Lariat with 55R. OWL tires are replaced by BSW tires in Payload Groups 622/623, with the OWL tires only being an option on the XLT. All 4x4s with 7700 Payload Group will now have snowplow capability. Captain's chairs now come with larger cup holders. 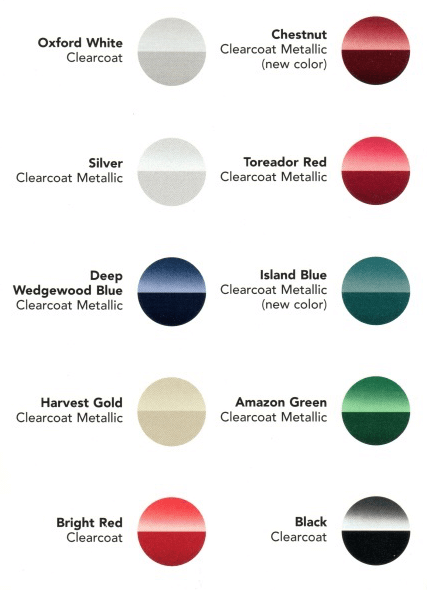 Exteriors are no longer available in Dark Toreador Red or Teal Clearcoat Metallic. Two-tone paint is now available on XLT Flareside and XLT w/Off Road Group. A 7700 Payload Group option is added. This is available on the 4x2 and 4x4 Styleside Regular Cab (139" WB) and SuperCab (139" WB) with the 5.4L V-8 engine. This option increases GVRW to 7700lbs and includes heavy duty components and 3.73 rear axle. Carpet delete for the Lariat and rear seat delete for the Work Series trucks are no longer available. The available trim levels were a slight change from the year before. The choices for F-150 were Work Series (previously was Standard), XL, XLT, or Lariat. The higher end King Ranch will show up next year, and even higher level trucks will be added with the next generation F-150. The SVT Lightning was available in 2000 again, after being re-introduced in 1999. Fun fact: The base trim level is called Work Series in the US and Standard Series in Canada. Interior color choices were Dark Graphite, Medium Graphite (same as last year), and Medium Prairie Tan was replaced by Medium Parchment for 2000.